My writing chops feel a bit like our first glimpse of the Tin Man in Oz. 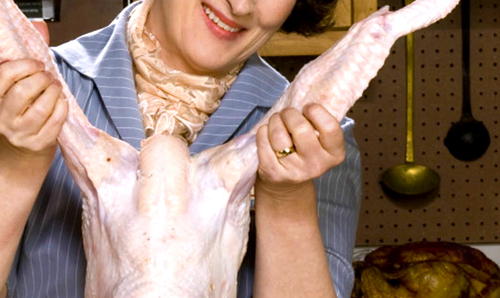 Last night, I finally got around to watching the wonderful film, Julie and Julia. When I’d first heard tell of the film, I couldn’t envision what all the fuss was about: “Girl Cooks Her Way Through Julia Child’s French Cookbook.” It just didn’t do it for me. Then I watched it. I can only assure you that it is so much more than at first it seemed. I laughed. I cried. And all for the best of reasons. Now, I realize that this isn’t intended to be a movie review blog. Fear not. What I hope to convey here are but a few of the many ways in which the film provided glimpses and reminders of real life and the things that matter. Rather than be long-winded or pedantic, I’ll simply give you the short list, which I trust will whet your curiosity – and appetite – just enough to spur you to enjoy the film for yourself if you haven’t already. 1. Meryl Streep is amazing (all right, this doesn’t technically fit into the category of “glimpses and reminders of real life and the things that matter,” but I just couldn’t go any further without mentioning it). 2. While Julia Child (for those fortunate enough to remember her) was largely known to us for her eccentricity, her characteristic warble, and the small space we saw her occupy in her television kitchen and dining room, she was a complex, wonderful and fascinating person. Tenacious. Willful. Romantic. Positive. It was a good reminder, once again, not to ever ever see people as two-dimensional or defined by the role for which we might happen to know them in moments. Teachers. Parents. Children. Police officers. Store clerks and bankers and flight attendants. And the “loser” at the end of the bar. We are all real people with multifaceted lives – people worth knowing more about. 3. Julia Child was not a life-time chef nor born to chefs. She just decided she wanted to cook – and be good at it – because of her personal experiences with the food of Paris. She began this pursuit at nearly 40 years of age, at a time when the culinary arts were dominated by men. Against the odds, she set her heart on something and, through hard work and love, became a world-renowned figure. It is truly never too late to find something you love to do – and do it. Julia is quoted as having said, “Eat well. Live Big. Bloom late.” This seems to me a wonderfully inspiring motto by which to live. 5. Both Julia and Julie had people who absolutely adored them. And some that hated them, seemingly making it their sole goal to oppose them. Why? Because Julia and Julie were passionate about something and succeeding at it. And best I can figure, this just ticks unhappy people off, for some reason. The film bolstered my resolve to keep my course set, to do what I do because I believe in it and love doing it, and to give as little thought as possible to the naysayers and troublemakers along the way. 6. Julia’s world-changing book, Mastering the Art of French Cooking – was a whole lot of work. In the days before computers and spell-check, using manual type and carbon copies, it was all the more so. She faced the difficulty of co-authors shirking duties. She experienced the highs and huge disappointments of publisher interest – and then rejections – before the final elation of seeing the book go to print only many years later. Likewise, the film’s other heroine, Julie, struggles through keeping a daily blog for one year, as well as the intensive cooking commitment involved (524 recipes in 365 days!). All of this reminded me of the joys and struggles I myself have faced in the writing process. But more so, it reminded me to remind us all – that anything worth having is worth fighting for. Now, in the spirit of so many of my previous blog posts about taking chances and experiencing new things – for Pete’s sake, see the film, will ya? (Yes – guys, too. No one will tell.) Love it. Hate it. Makes no difference. The point is to keep trying something different. To challenge yourself. To stay open-minded. To think new thoughts. To broaden your world view. Or maybe even to try cooking a new dish. Excellent post! I recognized some of our conversation yesterday regarding opposition. Now I will HAVE to see what I thought would be a dull movie. I have now gone twice to the Smithsonian Museum of American History to view her kitchen. There is a kiosk that plays videos on demand. I choked up, not at least partially due to the fact that my grandmother introduced me to Julia Child and we would watch her together. I was recently pleased to find that the cooking channel is replaying her old episodes. Oh boy! I’m gonna look for them! Thanks, Rod.